This Southern Africa holiday takes you on an adventurous journey across Zimbabwe, Botswana, Namibia and South Africa, along with a group of like minded travellers and an expert tour leader. Travelling in our overland vehicles (also known as Landos) is an exciting and wallet friendly way to travel through this region, and nights spent camping out in the wild will get you up close and personal with the local wildlife - hearing the roar of lions in the distance, for example, or walking up to the sound of elephants moving through the trees. 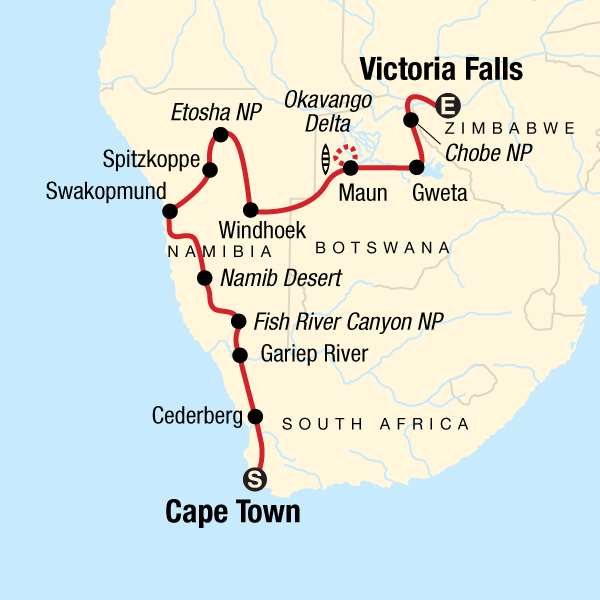 Highlights of your trip include the chance to try skydiving, sand boarding or another adrenalin fuelled activity in Swakopmund, one of Africa’s adventure capitals; going on a wildlife safari in Etosha National Park; climbing sand dunes in the Namib Desert; and viewing the thundering waters from the Zimbabwean side of Victoria Falls. A problem in highly-visited cities in Africa is that only a small proportion of the businesses benefit from the revenue that travellers bring. The hotel in Cape Town is located in a downtown urban community, unlike many which are in the central business district (CBD). This brings travellers to a part of Cape Town they may not have seen, and allows for interaction with local people in their own environment, encouraging support of local businesses, from grocers and taxis to restaurants and bars. Visiting the wildlife areas of Etosha National Park and the Okavango Delta, the tour contributes conversation fees that go to the authorities of those natural areas, who then in turn use the funds for the conversation of the environment and wildlife in their domains. Travellers are encouraged to respect the animals while viewing them – i.e. keeping a safe distance, not using flash and not feeding them. Our campsites have environmental policies – plenty of bins for rubbish, designated campfire areas to prevent possible fires, water facilities will have notices on conserving water by taking short showers so there is enough for everyone.